The Makandi Dewul temple beside the Beturni Tank, near Gaya (Bihar). 29 December 1824.
bl.uk > Online Gallery Home	> Online exhibitions	> Asia, Pacific and Africa Collections	> The Makandi Dewul temple beside the Beturni Tank, near Gaya (Bihar). 29 December 1824. 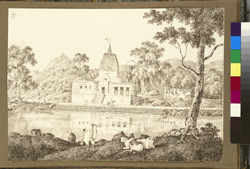 Pen and ink drawing by Sir Charles D'Oyly (1781-1845), of the Makandi Dewul temple beside the Beturni Tank, near Gaya (in Bihar, from an Album of 80 drawings of views in Bengal and Bihar taken between January 1823 and May 1825. The largest group of drawings consists of sketches made between 26 January and 27 February 1823 during a journey from Calcutta to Gaya (Bihar) along the 'New Military Road'. Another group, drawn between 18 December 1824 and 2 January 1825, were clearly made during a Christmas tour to Gaya when D'Oyly visited his friends George Proctor Beauchamp and Christopher Webb Smith. The 'New Military Road' passed through Manbhum district (Bihar) to Hazaribagh (Bihar) and through the hills to the N.W. to join the present Grand Trunk Road near Sherghati (Gaya district, Bihar). Begun in 1782, it had semaphore signalling towers built along it in the early years of the 19th century. Gaya, near the sacred site of Bodh Gaya, where Buddha achieved enlightenment, is also a very important site for both Hindus and Muslims. This image is the original drawing for plate 18 of 'Sketches of the New Road in a Journey from Calcutta to Gyah' (Calcutta, 1830). D'Oyly wrote, "This sacred building is very prettily situated on the Road from Gyah to Bhood Gyah and generally passed in the Evenings Drive. The reflection of the Temple and its surrounding Trees, as well as of the Hill rising behind it greatly enlivens the Scene. The pinnacles of this as well as all the more elevated Temples are ornamented with flags of various colours."